Now this is a true underdog story. When Doug Haverford was laid off from his job as a warehouse foreman, he didn’t know where to turn for help. He had no college degree, no job prospects, and no savings to fall back on. But even through the toughest of times, Doug never lost hope that things might get better someday. Now just three years later, his luck has finally turned around: Doug is the proud co-owner of a dinner jacket! Inspiring! Doug just proved that a little perseverance can go a long way. For some time, Doug worked whatever odd jobs he could find to support his family, was nearly evicted from his house for not paying rent, and even had to sell his pickup truck to make ends meet. The husband and father of two had hit rock bottom, but in retrospect it only made his climb to the dizzying summit of dinner jacket co-ownership all the more amazing. One day, an old acquaintance looked him up in the phonebook, called his house, and asked him to go fifty-fifty on a navy blue polyester dinner jacket! In Doug’s darkest days, he worried that he might not even be able to put food on the table for his wife and children. Now here he stands, in charge of half of this fine piece of menswear custom-tailored precisely to the average of his and his jacket partner’s dimensions. He may still be out of a job, but he will always know that access to a quality dinner jacket is just a phone call and a 60-mile drive away. Asked what he wished he could say to his former self, Doug paused for a moment. He pulled out his half of a white silk pocket square and tucked it neatly into the front of the coat. 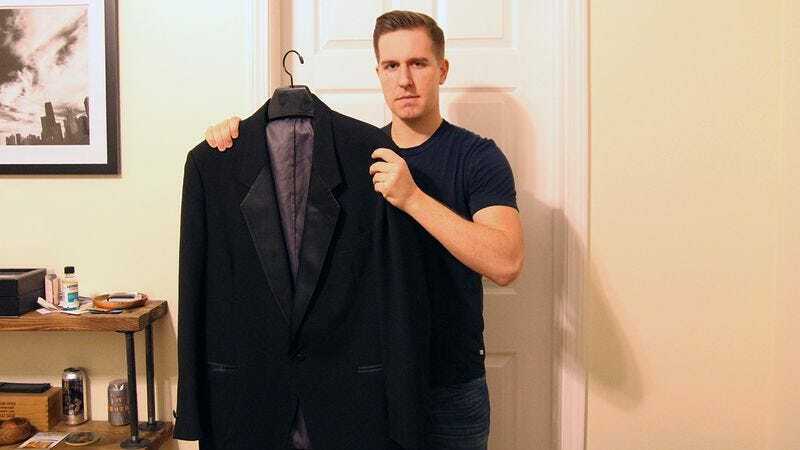 Doug’s resilience serves as an important lesson to us all: No matter how bad things get, just keep fighting, because tomorrow might be the day you end up sharing custody of an elegant, business-casual dinner jacket. Way to go, Doug!